Five poems (quintet), Walters Art Museum Ms. W.607, fol. 29b, originally uploaded by Walters Art Museum Illuminated Manuscripts. This is an illustrated copy of four of the five poems that comprise the Khamsah of Niẓāmī Ganjavī (d.605 AH / 1209 CE). It does not include Laylá va Majnūn. The text was copied by a certain Yādkār the Calligrapher (al-Kātib) in 935 AH / 1529 CE, most probably in Safavid Iran. 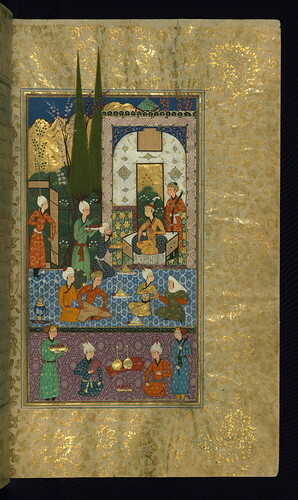 An illuminated double-page composition opens the manuscript and each poem is initiated with a decorative headpiece. The miniatures appear to have been repainted at some point in the manuscript’s history. Their date and provenance are open to question. The textblock is bound in late Zand lacquer covers with scenes depicting Bahrām Gūr hunting and Khusraw watching Shīrīn bathing. At a court gathering an old woman speaks with a confidant of King Jamshīd.